Did you know all of the District’s drinking water comes from groundwater? The District provides drinking water to over 14,000 homes. Water is pumped from 16 wells around town, disinfected and then immediately starts serving houses on its way to fill up the water tanks. Our groundwater originates right here in the watershed that we live in. Snow falls in winter, melts in spring, and travels through a vast network of groundwater aquifers to the lake. By pumping water from these aquifers, South Lake Tahoe has some of the tastiest and purest water in California. The District is the Groundwater Sustainability Agency for the South Tahoe Basin. In response to drought and groundwater resource concerns, the state of California passed legislation that establishes a new structure for managing groundwater. The Sustainable Groundwater Management Act (SGMA) requires locally formed Groundwater Sustainability Agencies (GSAs) be responsible for developing and implementing a Groundwater Sustainability Plan. By stepping up to serve as the Groundwater Sustainability Agency for the South Tahoe Basin, the District is helping to ensure that locals have the primary say, and responsibility for, managing South Tahoe groundwater, instead of the state. In the summer of 2017 the District hosted a groundwater well survey of the 600+ private wells in the South Tahoe Basin to better understand South Tahoe groundwater and how to best care for our shared resource. Follow the link to learn more about the survey. In 1989, the contaminant tetrachloroethylene (PCE) was first found in drinking water wells near the intersection of Highways 50 and 89, referred to locally as the South “Y”. 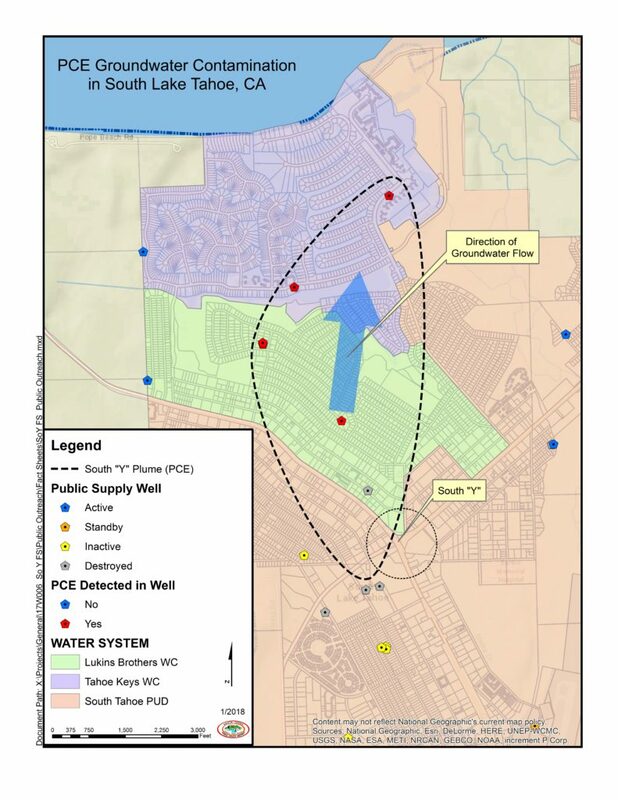 Today, the PCE remains in groundwater and forms a contaminant plume believed to cover an area of more than 400 acres. PCE is a manmade chemical that was used from the early 1960s through the mid-1980s as a solvent for dry cleaning clothes and degreasing metal. During the late 1980s, concerns about the toxicity of PCE led Federal and State environmental agencies to list PCE as a probable carcinogen and as a toxic pollutant. Presently, five public drinking water wells have been impaired by the South “Y” PCE Plume. Water suppliers in South Lake Tahoe are working together to protect and sustain our groundwater resource while ensuring that safe drinking water is provided to our customers. When PCE is detected in a well, the well is shut down and treatment is added to remove the contaminant; or an alternative source of drinking water supply is provided. Because of this, the water you drink in South Lake Tahoe is safe. Press -Since the contaminant tetrachloroethylene (PCE) was first found in drinking water wells near the South “Y” in 1989, the issue has been extensively covered in the news. 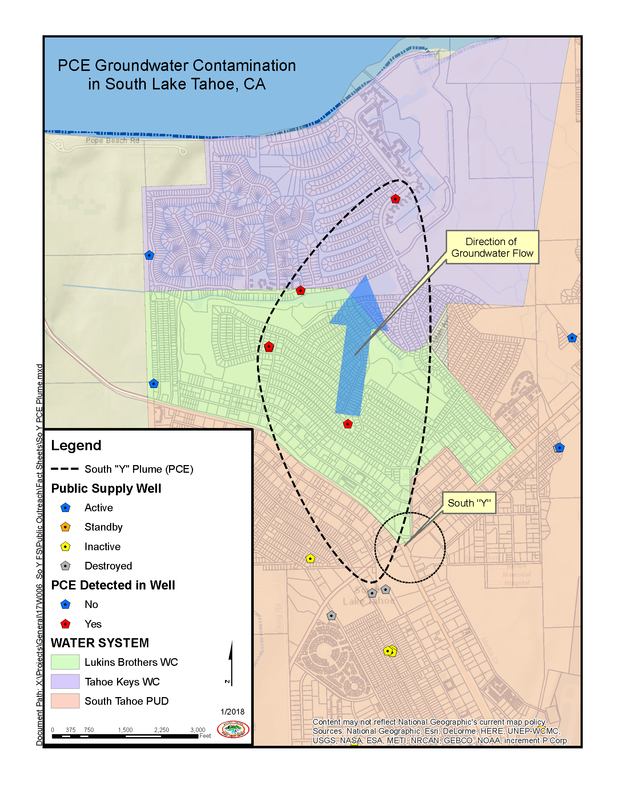 Groundwater Contamination at South Tahoe "Y"
Groundwater Contamination at South Tahoe"Y"